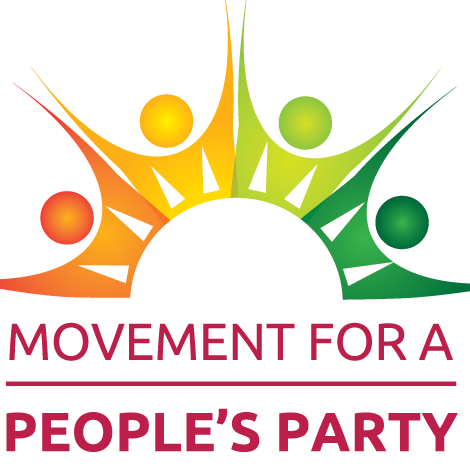 On its one year anniversary, Movement for a People’s Party [MPP], formerly Draft Bernie, is carrying the progressive torch from the Bernie Sanders’ campaign by releasing its platform along with its signature feature: an American Mission Statement. All across our nation, people go hungry while we produce more than enough food. People live on the streets when we have more than enough homes. People die sick when we have more than enough medicine. The problem is that meeting human needs is simply not the goal of our society. Our mission statement gives America the goal of maximizing human well-being and establishes that as the guide from which all policy decisions should flow. Our platform planks naturally follow from the mission of maximizing human well-being. They are a set of 24 principles that build on the Bernie 2016 platform and elevate the progressive policies that polls show the vast majority of Americans want. Indeed, about 60 percent of the American electorate is progressive on the issues. They want an economy that works for the 99 percent, clean energy, medicare for all, free public college, money out of politics, an infrastructure jobs program, the expansion of Social Security, net neutrality and so much more. In just one year, MPP has established itself as a leading political and organizing force on the progressive left. Draft Bernie was founded in February 2017 by Nick Brana, the national political outreach coordinator for Sanders 2016 presidential campaign, along with other former campaign staff, delegates and volunteers. When Draft Bernie began, reforming the Democratic Party was the major school of thought among Sanders supporters on how the progressive movement should proceed. In a single year, MPP has flipped the progressive narrative and added a new leading school of thought: the creation of a major new people’s party. “The establishment parties are so intertwined with corporate dollars that the money and the parties are no longer distinguishable from one another; big money is woven into the fabric of the organizations’. Moreover, they are highly-centralized, undemocratic and unaccountable to their base. They are corrupt by design and impervious to internal democracy at a fundamental structural level. The establishment parties lack the internal democratic mechanisms and channels that are necessary for outsiders to attain power within them. In other words, much like our government at large, the will of each party’s base is irrelevant to their management and direction. The parties are not democratic enough to be taken over. That is why we must heed the will of the American public and give them the major new party that they are calling for,” says Brana. Since its transition in November from Draft Bernie to Movement for a People’s Party, MPP has been aggressively building alliances with progressive political parties, organizations, academics, unions, students and movement activists. The establishment routinely collaborates against working people. To succeed, progressives must work together to replace the establishment. The nonprofit has signed up tens of thousands of members across the country and organized the Convergence Conference last September in Washington D.C. featuring Dr. Cornel West. Over the past year, Brana has gained recognition as a thought leader among millennials, having been interviewed by dozens of independent and mainstream media outlets and spoken on several panels with leading intellectuals and politicians. MPP has created the conditions for a major new progressive party to rise. According to Gallup, a record 61 percent of Americans are calling for a major third party and an NBC poll shows that 71 percent of millennials want the same. With polls showing that Americans are both progressive and they want a major new party, Movement for a People’s Party is the natural manifestation of what our country is calling for.